Another new restaurant and concept has recently opened at The Grandstand which is just diagonally opposite Omakase Burger. 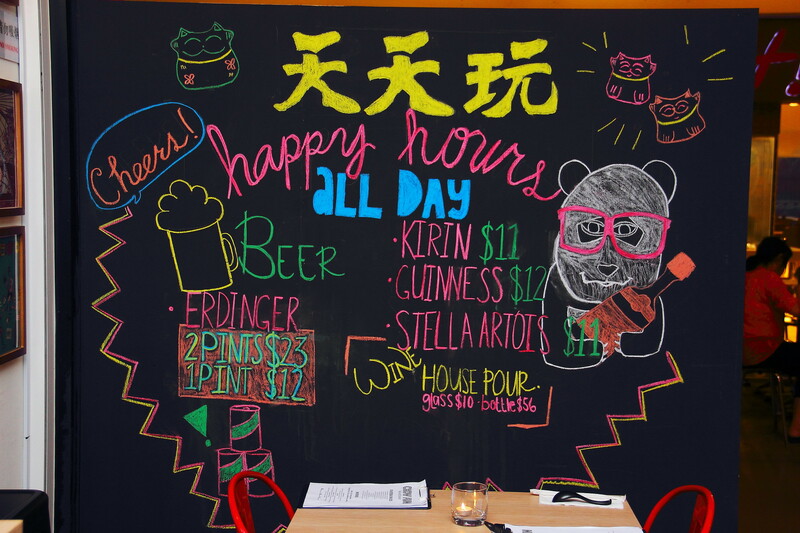 Chow Fun Restaurant & Bar is a modern noodle small plates bar that offers over 18 Asian and Western inspired noodle small plates, moreish snacks and all day happy hour. I was pleasantly surprised by the variety of noodles on the menu, it is like a mini Noodle Olympic where noodle dishes inspired from various countries and cuisines are gathered together. We started our dinner at Chow Fun with some snacks. 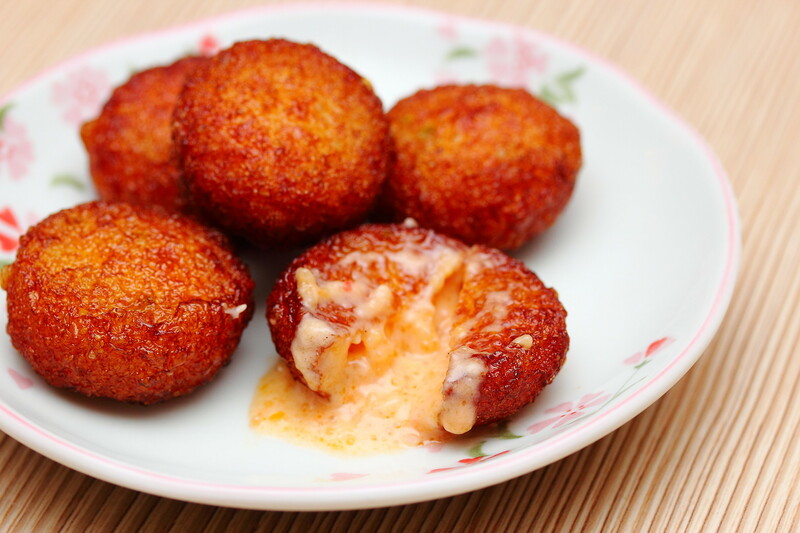 The Fish Roe Fishball ($6.90) comes with a fish roes and mayo stuffing in it. Do be careful while having it as the mixture may oozed out. I won't really call it a fishball as the flour ratio is way more than the fish meat. Nevertheless, many will enjoy the popping surprises of the fish roes in it. The Mom's White Radish Cake ($5.90) did not taste as good as it looks. The pan fried radish cake was rather light on the palate. It lacked the depth and fragrant from the Chinese sausages, dried shrimp and shallots. Even the dried shrimp sambal was rather mild, lacking the knockout punch. 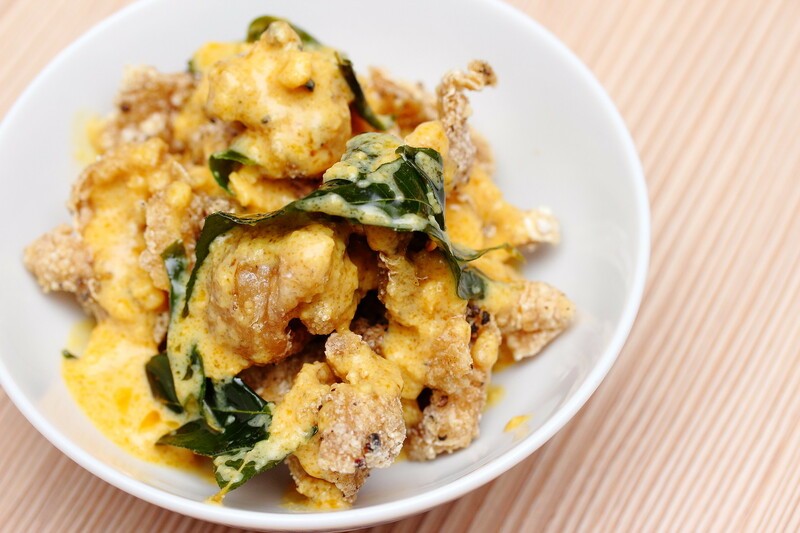 It was rather interesting to find the Salted Egg Yolk Chicken Skin on the menu. Love the salted egg yolk sauce. If the chicken skin could be crispier than that will be perfect. 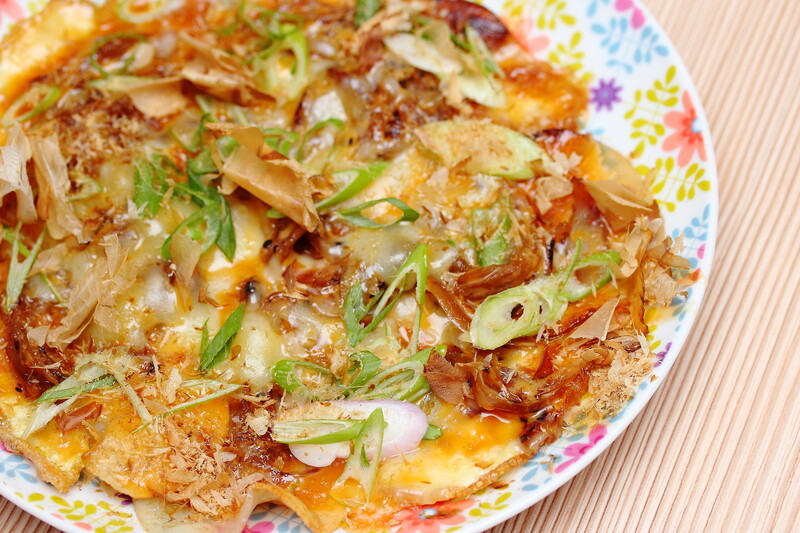 The Potato, Bonito and Cheese Pancake ($5.90) is a rather interesting dish which resembles a cross between a Swiss rosti and Japanese Okonomiyaki. A layer of thinly sliced potato rest beneath the pile of melted cheeses (Mozzarela, mature Cheddar and Granna Padano), topped with bonito flakes and spring onions. This is addictive combination that will be enjoyed by both young and old. The noodle small plates concept is sort of like Thai boat noodles but at Chow Fun you get to have a choice between hot and chilled noodles dishes with a gamut of different types of noodles and cooking styles. We started with the Ginger and Scallion Noodle ($2.90) which is served chilled. 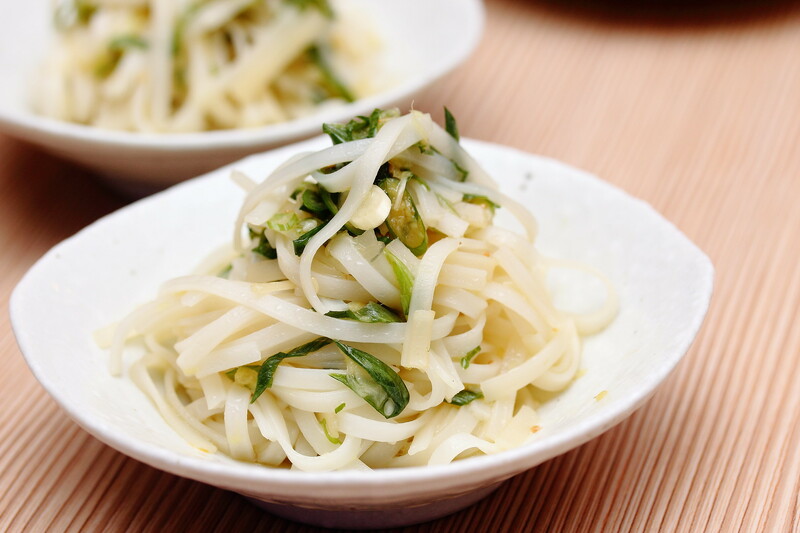 The cold noodles are tossed in a mixture of spring onions, ginger, vinegar, sesame oil and mirin. A very refreshing and healthy dish. One of my favourite noodle dishes is the Kung Fu Dashi Broth Noodle ($2.90) which reminds me of a tasty bowl of home cooked fried vermicelli. It may looked simple but the fried vermicelli cloaked in a savoury dashi broth is packed full of flavours. The Tom Yum Cream Udon ($2.90) is cooked in a spicy tom yum paste with sauteed mushrooms, tart cherry tomatoes, prawns and topped with crispy chicken skin. 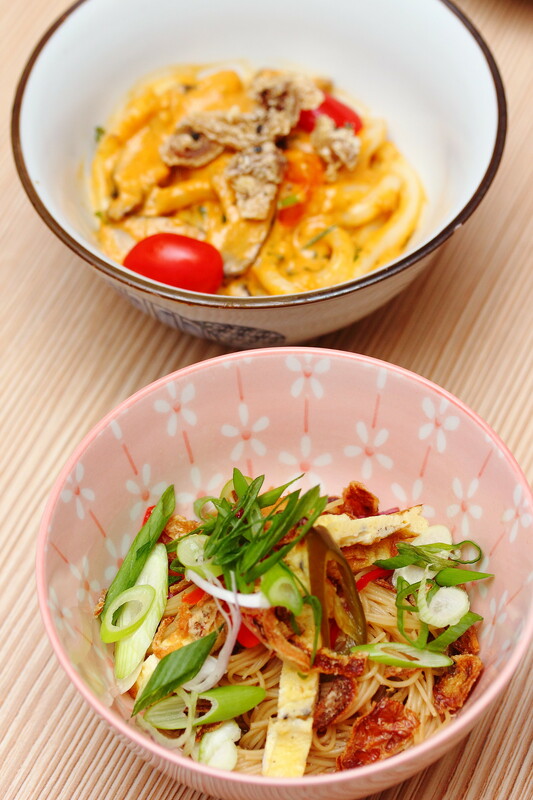 A modern fusion of Thai flavour and Japanese noodle. The spicy and sour combination on top of the chewy bite of the udon would be well received if not for the fact that the kitchen is a bit heavy on the salt. 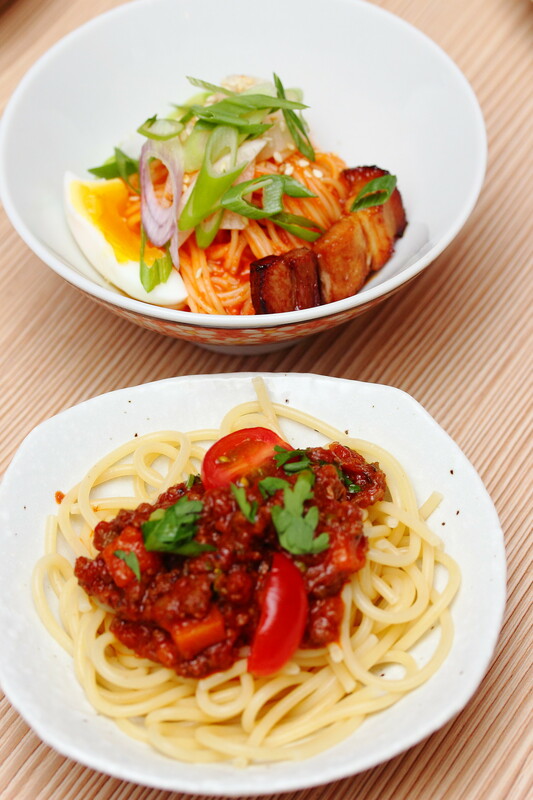 Another homely and comforting noodle dish on the menu is the Wagyu Bolognese Pasta ($2.90). The ground wagyu beef is slowed cooked for 12 hours together in a hearty tomato sauce that complement the perfectly cooked spaghetti. The traditional Korean bibim guksu is a cold noodle dish but Chow Fun's piquant rendition of Pork Belly Bibum Guksu ($2.90) is served warm with gochujang stirred into the rice noodles with house made pickled radish with coriander seeds, and crowned with unctuous silvers of sateed soy ginger glazed pork belly. This is the other favourite of mine. 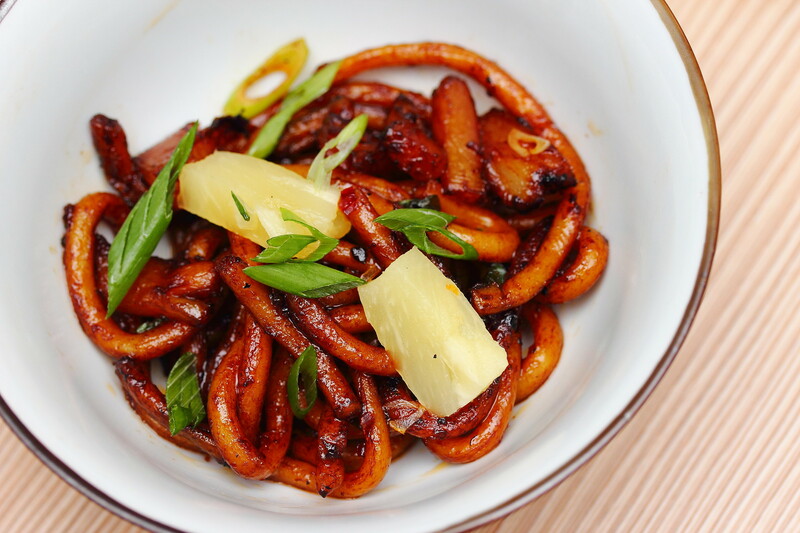 The Pineapple Noodle ($2.90) is akin to the Malaysian Hokkien Mee. While the dark sweet sauce and mirin is quite delectable, the texture of the noodle was kind of rubbery which I did not enjoy. 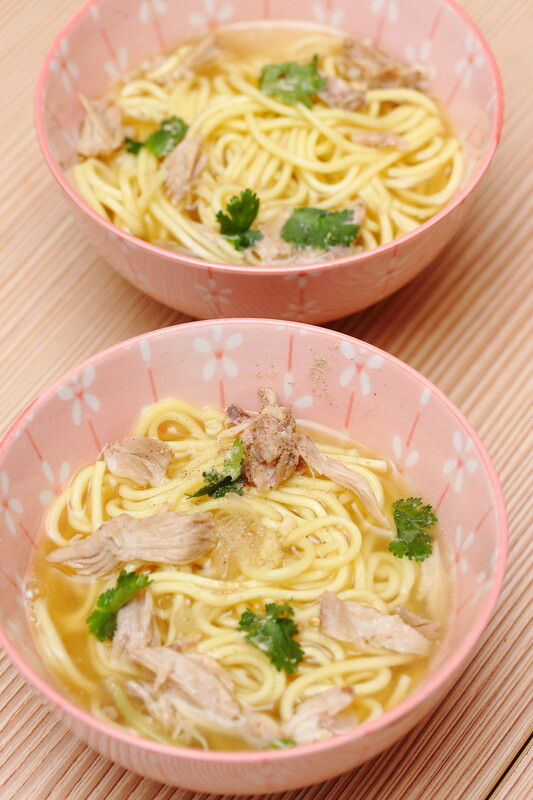 The only soup dish we tried is the Bak Kut Teh Noodle ($2.90). Flavourful broth but once again on the salty side. If you have limited stomach space to try all the 18 Asian and Western inspired noodle dishes, then I would recommend spending your dollar on the Pink Shrimp Pasta ($2.90) and Wild Mushroom & Truffle Pasta ($2.90). The sauce of the pink shrimp pasta stood out for me. 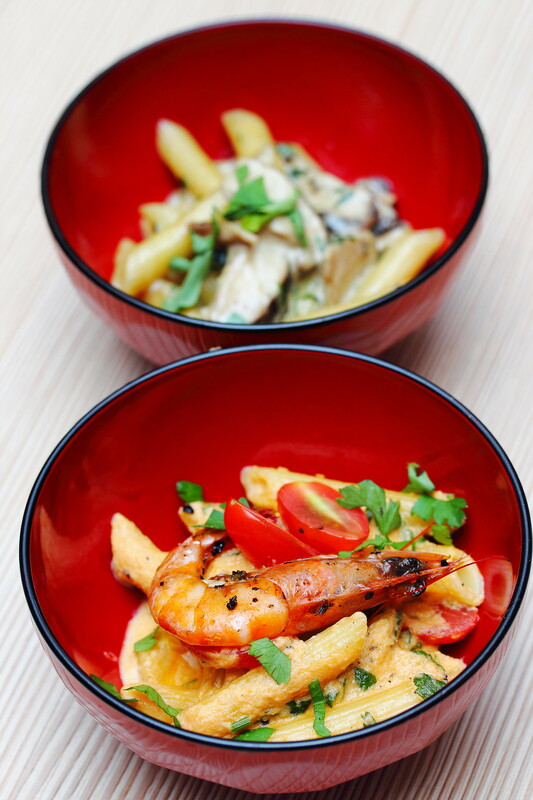 It is prepared by cooking shrimp in white wine and tomato and then blended with cream, resulting in a robust and briny seafood flavour that goes very well with the penne pasta. Besides the snacks and noodles, Chow Fun also offers a decent mix of Asian and Western desserts on the menu. 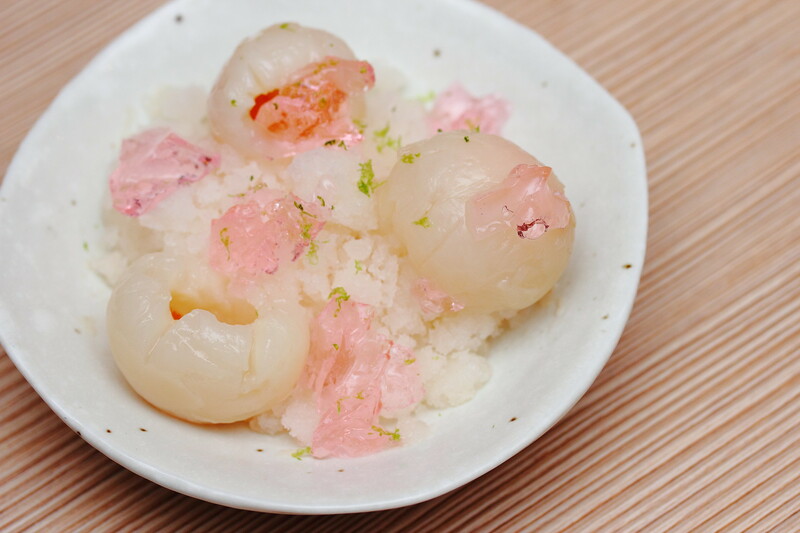 The Lychee Granita And Crystal Jelly ($4.90) is a light and refreshing dessert to wrap up the meal. I thought the granita was a rather bland, it needed a bit more zest to it. 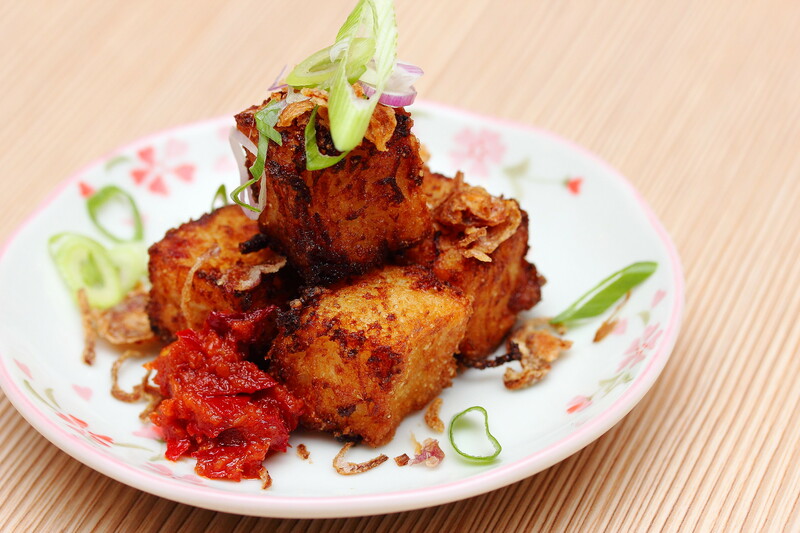 I am surprised to find Goreng Pisang at Chow Fun. Oh! I meant Deep Fried Caramelized Banana Fritter ($6.90). 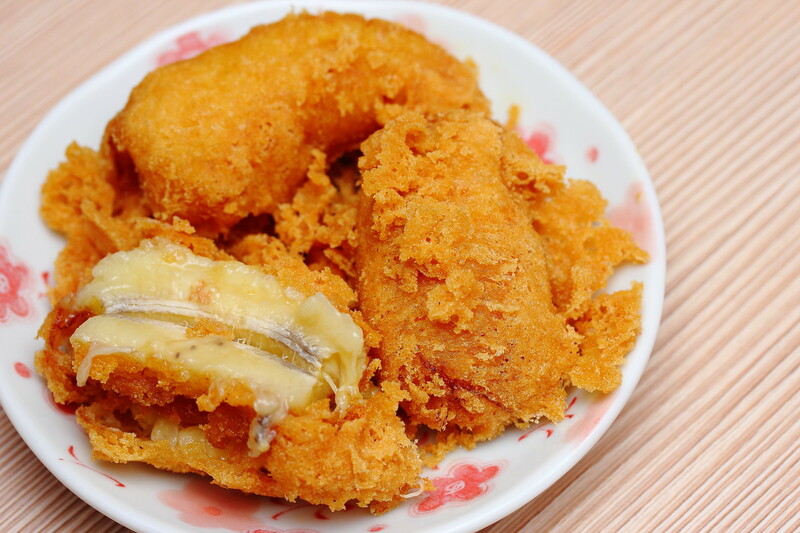 Crispy batter coupled with the sweet banana, this is just too addictive to stop at one. Homemade Tang Yuan ($6.90) in ginger soup is another tradition dessert in the menu. 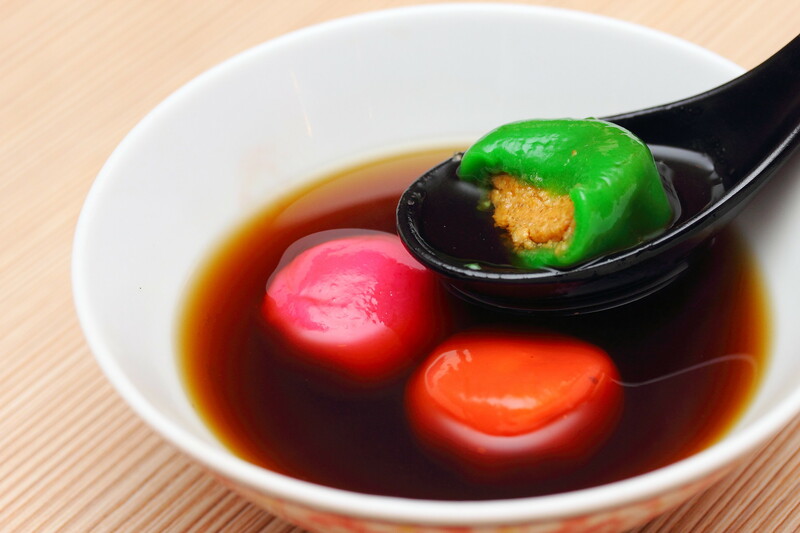 It comes with a trio of Tang Yuan with red bean, peanut and sesame filling. I was actually taken aback that the sesame tang yuan is actually salted. It did bring a little different twist and surprise to the table. 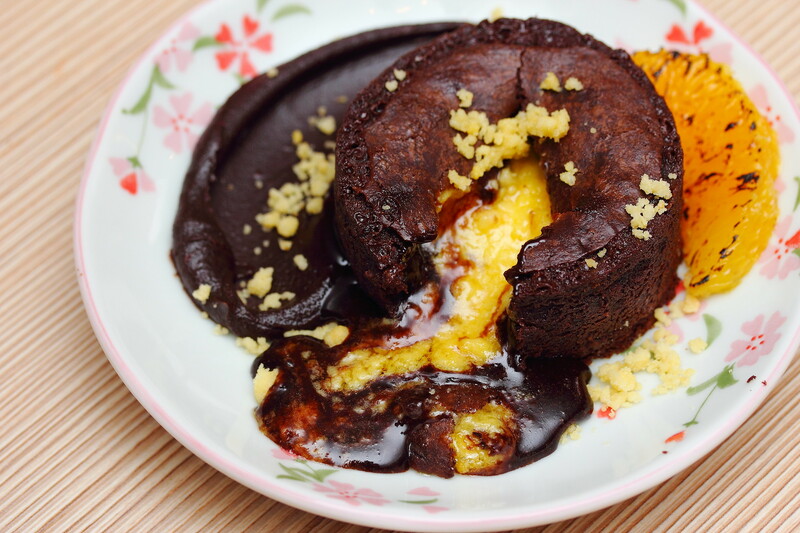 How to resist the lava flowing Salted Egg and Chocolate Lava Cake ($8.90). It is a combination that satisfied by internal craving. The cake was rich and moist. Unfortunately I could not really taste the salted egg. This is my second time to come across this combination and in both occasions the chocolate is too overpowering for the presence of the salted egg.